here's a few photos from this past weekend. some would say slow over all, but those who fished were rewarded. yeah, as far as number went, it was kinda slow for the couple days we were out, but there were some darned nice fish coming up at all hours. we fished up on tamarac bar in 20 - 25 feet of water. every thing was used including a demon with two gulp maggots. to the surprise of all, that's what caught the 24 incher. the biggest was 26 inches. some nice pike and a few of them pesky 10 inch perch as well. the big blow saturday meant lots of plowing yesterday. just out from Highbanks Resort. lots of plowed areas, now it's just up to you to get out there and give it a go. some good reports coming in from the big island area, and out to the west as far as the plowed road and then some by snowmobile. sorry about lack of details, they weren't devuldging their secrets. warm weather is once again forecast later this week, through the weekend. nice fish, i will be up this weekend, friday to sunday. recommend any spots for walleyes? sounds like most places are biting. not sure what to tell you solid oak. we have been getting fish on any of the humps and bar edges from dusk to 7-8 A.M.
many big fish coming in all through the night. we have yet to land on a mother load of eaters. we are going to keep pushing until we find them. maybe their in 34 feet of water? maybe their in 8 feet of water? until I can figure it out, we will keep putting houses on what we know. my best advice is to find a hump with an interesting feature like a funnel or saddle, an inside turn, or a shelf, or all of the above, adjacent to deep water that hasn't been harassed yet. set up and give it your best shot! Is that your buddy goose w/ the big gator? How big was that pikeasoarus? That doesnt look fun, It's funny though, the things we go through to enjoy winter. Then we tell ourselves we couldn't live without it!!! that was goose in that picture. I don't know, it was about 6-7 pounds I spose? me n goose went out to our secret spot and [PoorWordUsage] pounded the walleyes, just like we do early ice. caught 14 or fifteen eyes and about a half dozen hog perch in two hours. we set up at 4:45 and had the first walleye on the ice at 5:05.
no pics though. my camera is broken and I cant afford a new one. gonna have to use my wifes camera I spose. the biggest was 20 inches and we had a few dinks. most eaters went from 13 inches to 16 inches. goose caught a bunch on buckshots with minnowfaces and I caught most of mine on the gamaktsu favorites in glow. felt good to smoke em again! You're torturing me!!! I'm on nights all week, but gonna chase perch and gators on Friday. Planning on getting out next mid-week for some 'eye action out there. Leave a few for me would ya'? 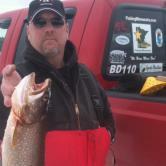 Nice walleyes and pike Dave!! You sure know how to get people on fish! Good Job! hey jigglestick, qiuck delete them pictures before garyc sees them or you might have him following you around some day! nice fish. hey lisa if your venturing from the womens forum does that mean you and your hubby might be venturing that direction soon? i would love to get that way before eyes close but busy. should get to cabin to do some spearin the weekend of the 21rst....i hops. you knoe priorities. I don't think so glenn. I'm not sure when we're coming back up to the cabin. Let us know how the ice conditions are when you get back up there Ok? lisa, if you havent already check the womens forum, i responded to barb on what we found on our lake the weekend of jan 17th. To late Glenn, already saw them, and thats OK, so long as he isn't fishing my secret spots. hee hee. We shall find out this weekend. We shall be very mobile. Jigglestick by the way nice fish sir. I take it you will be out Saturday. gary, I'll be out there. I forgot to mention, I found your gps and it's YOUR hotspots I've been hitting. I won't be fishing the holy land though if you were wondering. I'll be in the neighborhood, but the holy land is off limits during the weekends. the only way to keep it holy. Dang I was wondering where that went to. I'm bringing the sleds, so the holy land may get a visit. . I don't drink beer, so a Pepsi is all I can offer, however there will be some I am sure, via my buddy. He drinks it. Of course looking forward to a High Banks special Bloody Mary at the end of the day. Before we clean some fish. stoppin in at morries on the way up are we! you know most there fish are cleaned fron what i hear. sorry bud absolutely could not turn that chance down! Does anybody plow a road out to ravens point? Just wondering what I should bring up. I have a portable as well as a wheel house. Maybe I should bring both but I don't have a sled or a wheeler so the portable might be worthless if I can't off road with the truck. Any suggestions would be appreciated. ndsu, hard to say what it's going to be like after this warm up, but right now, a 4 wheeler is almost worthless. a snowmobile or other tracked vehicle is the way to go cross country. Ravens point...I think that's where we scratched a road out to yesterday. not sure, you'd have to ask Rick, I was just being the wingman. MORRIEs ohhh nice shot. Can you give directions. I have never been there myself. If I mention your name, will that help. id bet if ya googled it you could get directions. hehe. i was there once in the branierd store cause my wife wanted crab legs etc. i got some salmon smoked and for grillin. nope they dont know me! have a good trip north there big guy! as of 7:00 p.m. last night there is a road now out to the big island area. it does not go quite to ravens point. there is a big crack that popped last night that cuts us off from it right now. it is supposed to cool down the end of the week so it should tighten up enough to cross it somewhere. off road travel is still tough. hard to chisel through with the v plows even, but were getting it done. saw a fellow and his wife stuck in a snowbank today and she was shoveling. he had a big boss plow on and figured he'd blaze a trail where ever he wanted. turns out he had a broken foot and that's why she was shoveling. I hooked the rope to him and a quick tug had him back on dry ground. twenty minutes and twenty bucks later, he had his truck and hard house 1/4 mile off the road to a nice piece of structure. I'll check with him in the morning to see how he did. the rentals are doing very nice for eater sized fish with even a 23 1/2 in for pictures. Keep coming with the good reports Jigglestick! We're headed up Friday - Monday! It sounds like I need to think about making another trip up your way. I'm sure you were able to test drive that pickled Northern by now. If so what did you think? I'll have to bring pickled eggs up on the next trip. I hope the fish on Winnie don't get a look at your avatar. They may just run and hide again.